Although we no longer have our own research rooms the Geelong Family History Group has significant resources for both members and researchers. Geelong and District Database: The Geelong Family History Group is a major contributor to the Geelong & District Database. As at May 2018 there were more than 1.7 million entries in this database which is free for all to search. See more about this database below. GFHG Research Officer: – Has access to all former GFHG resources and all other local resources. The Society offers an efficient and professional Research Service. Subscription Journals: The Geelong Family History Group subscribes to a number of Australian and Overseas journals. Journals are available at meetings for members to borrow. Digital journals are available to all members via the GFHG Google Drive. Various Indexes and Resources: available to members via the GFHG Google Drive. Numerous indexes compiled by GFHG members over almost 4 decades – many produced prior to the use of computers. Previously visitors to our library would have to search dozens and dozens of typed indexes looking for names – this can now be done with one search in the Geelong and District Database. 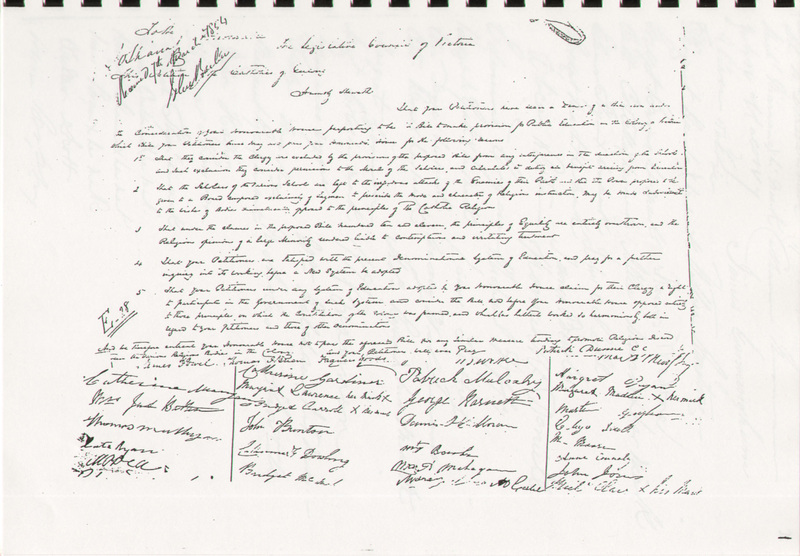 Indexes of scanned documents – the image above is a scan of a Petition by the Geelong Catholic Community for a School 1854. Indexes of GFHG publications – this assists people to see if their family features in one of our publications. Indexes of multiple local history publications. Indexes to early GFHG Pivot Tree journals. NOTE: we are now indexing ALL Pivot Tree journals and adding them to the database. Indexes and transcriptions of ‘local’ midwives and nurses from the Victorian Government Gazettes. Multiple indexes or transcriptions done by volunteers from the Geelong Family History Group – scanned documents from the Public Record Office Victoria; entries from relevant Victorian Government Gazettes; new resources identified relevant to Geelong and District. Don’t forget to read the TIPS, WARNINGS and INFO page to get the most out of your database search. We haven’t finished indexing everything on our project list and we keep finding new resources to transcribe or index – if you would like to help, please contact us – we’re always looking for volunteers.